Bill and Mary Andra are pleased to announce the marriage of their daughter Colleen Mary to Wilburn Norwood Jonas, son of Joseph and Lillian Jonas. 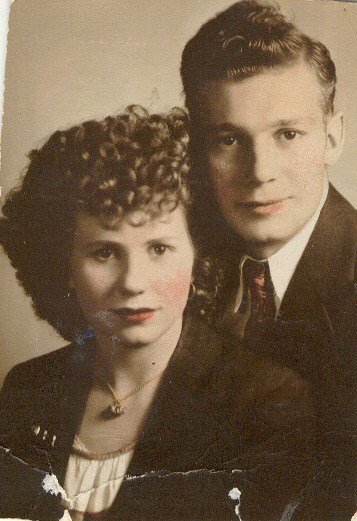 They were married in Elko, Nevada on 27 September 1946. Colleen is a 1946 graduate of Preston High School. She is currently pursuing a degree at Brigham Young University. Norwood attended North Cache High School. He is currently employed at Pet Milk in Richmond. The couple will make their home in Richmond. While short and sweet, I think that is what their announcement may have been like. What else is in there between the lines? Norwood and Colleen met at the Persiana in Preston, Idaho. A dance hall on the second floor of the building. William and Mary Andra were not entirely pleased with Colleen’s selection of a spouse. The poor boy from Richmond who smoked and drank was not an appropriate mate for their daughter. Not only that, she loved him so much that her parents did not see this as a good influence on her even while they dated for a couple of years before. While not entirely supportive, they allowed their daughter to make her own choices after having a number of clear, frank conversations with her. If this is what she wanted, then she could do as she pleased. But she was well aware that much heartache and pain could be in her future, at least as her parents predicted. With so little support from her parents, many of her siblings liked “Nor” for the most part. He worked hard and provided for his family and that is most important. Joseph Jonas had died 14 years earlier and would not be around for this occasion. In fact, Norwood saw his father electrocuted before him on that fateful day in Ogden, Utah in 1932. Norwood often took his father his lunch at that time because they lived in railroad housing not far from the switchyard where he worked. Nor walked up the tracks and his father saw him coming. He stepped down from the locomotive they were working on to the track and started walking toward Norwood. A Mr. Child who had been warned earlier to move the line had not done so and Joseph hit his head. Norwood saw his father thrown back to the ground. Mr. Child made the mistake that killed Joseph that day and every time he saw the family he always apologized for the death. If that wasn’t a burden to live with for Mr. Child, it was for Norwood. His brother, Ellis, indicated that was the day the lights went out in Norwood. Nor’s mother, Lillian, also indicated Norwood was never the same after that day. 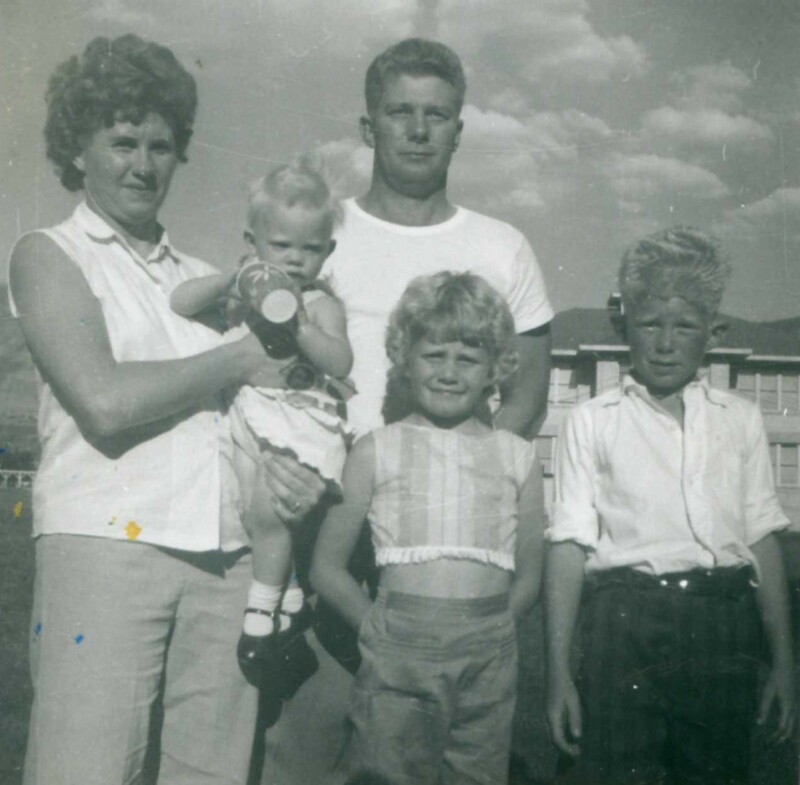 The family lost their housing with the railroad and moved back to Richmond, Utah. There the family had to live in two train cars placed side by side for years to come. Finally the family could afford to move into a little home of a few hundred square feet, but that was after most, if not all, the children were gone. Lillian (nee Coley) was a humble, faithful widow who did what she could for her children. Much relied upon the good people of the ward in which she lived, but the boys had their crazy days without a father. The Jonas brothers were known to be a rough, mean bunch. The meanness only exacerbated by alcohol. Colleen had graduated Preston High School and followed her parents suggestion by enrolling at Brigham Young University. I think the parents probably hoped some good boys would come along. However, Norwood and Colleen could not bear to be that far apart and Norwood came down to pick her up at school after only a few days or weeks there. They drove back north and would eventually take Lillian and run to Elko to “elope”. Norwood attended North Cache High School but never graduated. Only one of his siblings would graduate from high school (Ellis). Norwood was bright and able to keep up with school. So much, he attended with classes with his older brother, Irwin, who was two and a half years his senior. Norwood even shows in Irwin’s class pictures. But the life of the widow was hard and the boys found employment as soon as they can to help with the family expenses. The two would be happily married for years to come. The first child would not come for 6 years after the marriage. Norwood and Colleen enjoyed the social environment and party of friends, often hosting Bridge and other card games at their home. Children would arrive in 1952 (Douglas Norwood), 1954 (Sandra, written about at this link: Baby Sandra Jonas), and 1960 (Jackie). I really don’t know much for sure of this period. Other than they seem to have lived the usual family life. Alcohol would eventually come to cause the majority of problems within the home and which would eventually take Norwood’s life in 1975. Colleen’s journals from 1944-1946 can be found here. Colleen’s Journal 1944-1946. I also wrote about the journal at this link: Colleen Andra’s Journal. While short in its entries, it tells more than anything I could have ever found out otherwise. Everyone, keep a journal, even if only one sentence a day. That one sentence tells scores of information decades later. I treasure every word. I wish she had such a journal extending through every year. This entry was tagged Andra, Coley, Elko, Idaho, Jonas, Nevada, Ogden, Preston, Richmond, Utah. Bookmark the permalink.